Oxidation state (or oxidation number) refers to the number of electrons added to or removed from an element when it forms a chemical compound. Sodium metal, for example, has an oxidation state of 0 in the elemental state. But when it gives up its one valence (outer) electron (symbolized by e−), it becomes a sodium ion Na+ with an oxidation state of +1. Iron is another example. It can lose two electrons, forming an oxidation state of +2; or it can lose three electrons, forming an oxidation state of +3. If elements gain electrons, they have negative oxidation states. If chlorine gains an electron, it forms a Cl− ion (chloride) and has oxidation state of −1. If sulfur gains two electrons, it forms an S2− ion (sulfide) and has oxidation state of −2. The Na+ ions and Cl− ions then form a compound, NaCl, sodium chloride (table salt). Or the Fe2+ and S2− ions form FeS, iron sulfide. All free elements have an oxidation state of 0.
oxygen has an oxidation number −2 in most of its compounds except peroxides where it has an oxidation number −1. hydrogen has oxidation state +1 in most compounds except with electropositive elements like Na, where it has −1. oxidation states of all the atoms in a molecule add up to 0 and in an ion to the ion charge. 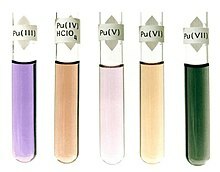 Examples: potassium permanganate with the formula KMnO4 has Mn in oxidation state +7, and CrO42− has Cr in oxidation state +6. This page was last changed on 14 November 2017, at 11:01.